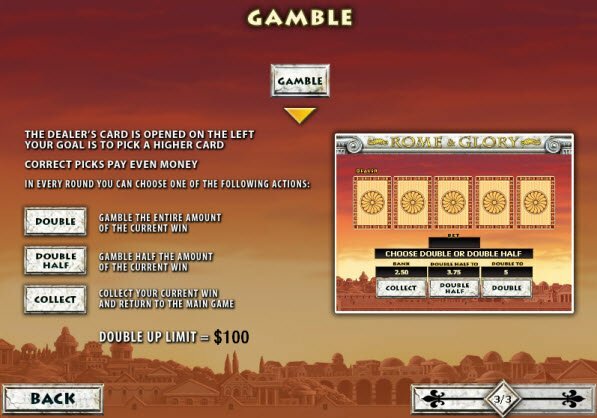 Play Rome and Glory Slot and experience the excitement of Ancient Rome. The graphics need improvement, but they capture the theme fairly well. After each winning combination, you can bet all or half of your winnings to draw a card higher than the dealer. This isn’t the first and only slot game out there depicting Ancient Roman culture, and it isn’t the best either. Playtech’s Rome and Glory Slot falls short of expectations. Graphics look as ancient as the theme itself. On the bright side, the game contains 5 reels, 20 paylines, a Free Spins Feature, and Gamble Round. Reel graphics include classic images from the Roman civilization. Chariots, grapes, chalices, scrolls, and coliseums create the atmosphere of the game. 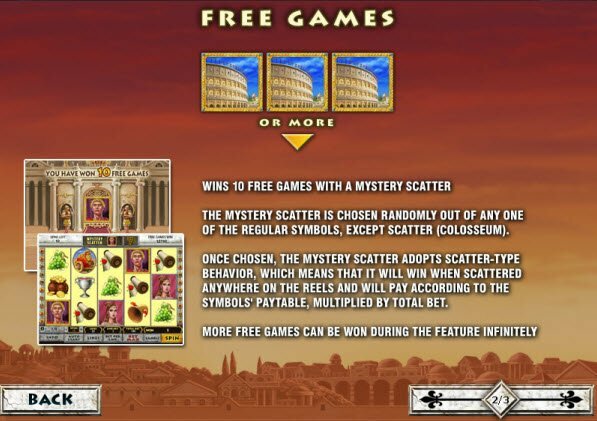 Although the Playtech game designers accurately portray the Roman theme, the overall graphic quality doesn’t compare to some of the better slots available. The coliseum serves as the Scatter Symbol. Not only does it substitute for all symbols, but it also activates the Free Games Feature. 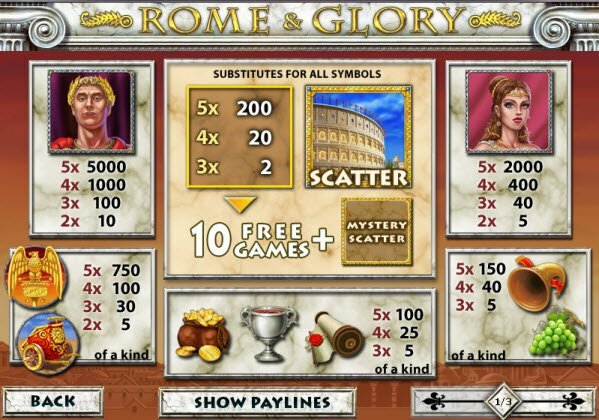 Although the graphics in the Rome and Glory Slot don’t impress, the game redeems itself with some rewarding features. The coliseum serves as the Scatter Symbol. Not only does it substitute for all symbols, but it also activates the Free Games Feature. When this symbol appears alongside a Mystery Scatter, you receive 10 Free Games. Wins during this feature are multiplied by the total bet. After each winning combination, you can choose to enter the Gamble Round. During the Gamble Round, you can bet all or half of your current win. The object of the game is to draw a card higher than the dealer.